The Bawell Fountain model is a 7 plate SMPS powered alkaline water machine featuring a forever lifetime warranty and 60 day 100% money back guarantee. The Fountain model posses the unique ability to be connected directly to your kitchen faucet or you can connect it below your sink to your water line. With a built in dual two filter internal filtration system you will get the best quality filtration available in any ionizer with this machine. Having 7 plates in your machine will allow you to have an increased range of PH and ORP. With the Fountain unit you have a PH range of 3.0 to 10.5 and an ORP range of +600mV to -500mV. This allows you to make high strength alkaline ionized drinking water with increased PH and intense antioxidant oxidation reduction power. In a glass of fresh squeezed orange juice you will find an ORP value of about -150mV, in fresh organic carrot juice you can find an ORP value of about -170mV, and in wheat grass you will find an ORP value of about -120mV. Just think of all the additional antioxidants you will get everyday by drinking the higher ORP values of up to -500mV from the Fountain machine! Drinking antioxidants in your water is a must for all of us and it is good for your pets too! 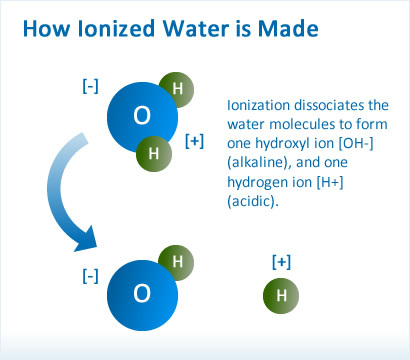 We guarantee that your dog or cat will develop a thicker, brighter, fuller coat from drinking this water in addition to the many other health benefits you will receive from drinking alkaline ionized water. Since this machine uses an SMPS power system (Switch Model Power Supply) you can make up to 1 gallon of high strength antioxidant drinking water every 30 seconds. In addition you will enjoy its many convenience features like voice, touch controls, and the ability to easily move from location to location with its versatile faucet or under sink connecting options. We are an A rated Better Business Bureau Accredited Company. Granular Activated Carbon GAC filter composed of high quality activated carbon. At 3 to 4 gallons per day the filter will last 14.5 to 11 months. The filter will last about 14.5 months if you use 3 gallons per day. If you use 4 gallons per day it will last about 11 months. We suggest you change this filter once per year. There is a filter life counter on the front of the machine and the machine will speak to you informing you when it is almost time to change the filter. Removes chlorine, pesticides including pesticide byproducts such as atrazine, industrial solvents (halogenated hydrocarbons), volatile organic compounds (VOC) and chlorinated hydrocarbons, polychlorinated biphenyls (PCBs), radon, benzene, arsenic, mercury, lead, chromium, heavy metals, polycyclic aromatic hydrocarbons (PAHs), taste and odor forming compounds such as MIB and geosmin, algal toxins, endocrine disrupting compounds (EDC removal) and other micro-pollutants, pharmaceutical and personal care products (PPCP removal), trihalomethane (THM) compounds like chloroform and other disinfection byproducts (DBP removal). This filter will only fit Bawell models. Pre-Activated Carbon PAC filter composed of high quality activated carbon. At 3 to 4 gallons per day the filter will last 17 to 13 months. The filter will last about 17 months if you use 3 gallons per day. If you use 4 gallons per day it will last about 13 months. There is a filter life counter on the front of the machine and the machine will speak to you informing you when it is almost time to change the filter.